adhesive pre-gelled electrodes, round adhesive pre-gelled electrodes, square adhesive pre-gelled electrodes and tens units accessories adhesive pre-gelled electrodes. Scroll down to see our selection of adhesive pre-gelled electrodes for sale. Adhesive Pre-Gelled Electrodes Tens Unit Electrodes are sometimes difficult to use, especially when they're not attached properly. Choose from our selection of Pre-Gelled Electrodes and say "Good-Bye" to days of fumbling with self applied gels. The different shapes and sizes will allow you to apply your treatments right where you need them. Not sure which Pre-Gelled Electrodes will work with your Tens Unit? Contact our customer service for assistance. What is a Adhesive Pre-Gelled Electrodes? 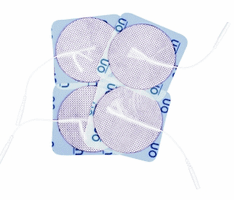 Adhesive Pre-Gelled Electrodes are designed for use with transcutaneous electrical nerve stimulation (TENS) units. They may be found in various shapes and sizes to best fit the users particular needs for instance the large size and butterfly shape allow for application of the TENS therapy on a larger area, typically the lower back, thighs and shoulders. The adhesive pre-gelled type electrodes are easy to apply and remove, these replaceable pads works well with both Electronic Muscle Stimulators (EMS) and TENS units and can be reused repeatedly until the adhesive wears off, or is re-gelled with a conductive type gel.